The largest rooftop solar project in New York City is delivering big-time savings and could pave the way for other large-scale commercial PV projects in the Big Apple. By melding modern technologywith an aging municipal infrastructure, the Ross Solar Group recently developed and successfully brought online a 1.56-megawatt photovoltaic solar project atop a large New York City food distribution center. Not only will the project save grocery wholesaler and owner Jetro Cash and Carry about $220,000 annually-about 45 percent of its electrical costs-it also marks the largest rooftop solar installation in New York City. As a pioneering project in the Big Apple, the Jetro installation should pave the way for other large-scale commercial PV installations, said Robert Kline, director of commercial sales for Danbury, Connecticut-based Ross Solar Group. "I think this sends a message that it's possible to do installations of this magnitude in this city and in this environment," he said. But the task wasn't easy and required the expertise and collaboration of several entities, including Harvard, Massachusetts-based Solar Design Associates and New York-based Consolidated Edison, Kline said. The solar installation was made possible through financial awards that Ross Solar received from the New York State Energy Research and Development Authority (NYSERDA) through Gov. Mario Cuomo's NY-Sun Initiative. The Queens-based Jetro Cash and Carry operates more than 100 wholesale grocery warehouse and distribution facilities nationwide. 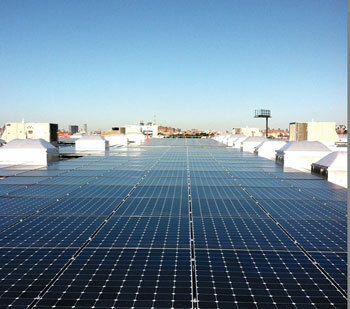 The Restaurant Depot building on which the PV system was installed is located in the bustling Hunts Point section of the Bronx, home to one of the largest food distribution centers in the world. Jetro began looking into solar in 2011, but it wasn't until 2013 that the company decided to move forward, Kline said. "We were in discussions for about two years before it actually got to the point where they wanted to move forward," he said. "It wasn't only with us-there were a lot of people that were trying to talk to them." 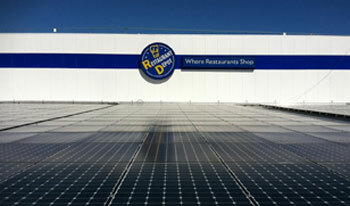 The Restaurant Depot roof lent itself to solar with its relatively flat slope and a minimum number of HVAC protrusions. The roof has good southern orientation with no shade. Ross Solar went with S5 clamps to attach the PV racking system to the roof rather than a ballasted system, so only minimal structural reinforcements were needed. In the end, Jetro decided to go with Ross Solar. "We considered a solar project for several years, but we wanted to make certain that it made financial sense for us as a company, and that the returns met our requirements," said Peter Claro, Jetro vice president. "Ross Solar Group's willingness to work within our specific guidelines, as well as their commitment to quality and full transparency were strong factors in our decision to move forward." City permitting was what one might expect from a large commercial electrical project-nothing out of the ordinary, Kline said. But the city fast-tracked it because of the solar components. The project was made financially possible by federal investment tax credits and depreciation as well as NYSERDA. The authority provided two grants for the project under the NY-Sun program, an initiative championed by Gov. Cuomo to increase the amount of solar generation in the state. Although for all intents and purposes, the Jetro installation was one project, it was divided into two for the grant competitive bid process, Kline said. Under NYSERDA, the projects were also eligible for per-watt rebates. The actual amount is based on a two-tier system and involves installed capacity. Between the state and federal programs, the Jetro PV system is expected to have a three-year payback, he said. Kline said the Restaurant Depot roof lent itself to solar with its relatively flat slope and a minimum number of HVAC protrusions. "It had no shade," he said. "It had really good southern orientation, and it was really just a perfect site." Ross Solar went with S5 clamps to attach the PV racking system to the roof rather than a ballasted system, so only minimal structural reinforcements were needed. "We were looking at 3.5 pounds per square foot, which is next to nothing," Kline said. "Jetro had some concerns about adding any kind of weight, but we worked with our structural engineers and the engineers who were responsible for building the structure. "We came up with modest upgrades, although our structural engineer was confident enough to say nothing had to be done." The PV system itself involves 4,760 high-efficiency SunPower E20 327-watt panels. Kline said as a SunPower elite dealer, the firm was familiar with the efficiency and quality of that model. "SunPower makes the most efficient panels on the market with the highest conversion rates," he said. "They're kind of the gold standard. Because of the high efficiency rates of the panels, we were able to fit more watts in less space." As an example, take a 327-watt compared with a 250-watt panel. "If you can put up 4,760 panels and you're getting an extra 75 watts per panel, that's a lot of solar, and then they're converting at a higher rate," Kline says. "They [SunPower panels] also have lower degradation rates so over time they degrade at a lower rate." Another feature that factored into the decision was the panel itself, he said. Solar panels have few moving parts to break. Most panels on the market are made using front-side metallization or using fine metal contacts on the front side. Over time, corrosion of these metals can lower panel performance. SunPower panels, on the other hand, have a solid copper backing and no front-side metallization. "So they're much more reliable as well as having a 25-year product warranty," he said. "When you put everything together with a company like Jetro-they're very smart guys who understand the value. It's a premium that you pay for-but in terms of value, it gives you a much better return on your investment." The Ross Solar Group, which developed and successfully brought online the 1.56-megawatt Jetro solar project, believes the installation should pave the way for other large-scale commercial PV installations in New York City. The company noted that the solar installation was made possible through financial awards that Ross Solar received from the New York State Energy Research and Development Authority (NYSERDA). Deliveries of the PV components were a logistical challenge and required working closely with Jetro. "It's a very big location-the problem is they're very busy, and they're open all the time," Kline said. "They have so many trucks coming in to deliver that we had to coordinate our deliveries. We couldn't interfere with their trucks, and there are only so many pounds you can put up on a roof." As a result, the panels were sent to a storage facility. Then one or two trucks at a time would deliver the panels and racking to the site in between food deliveries. The panel deliveries stayed just ahead of the crew on the roof, who installed the system in stages. Because the Jetro building has standing seam metal roofing, Ross Solar went with a racking system attached with the S5 clamps. "Any time we have to do an installation on a standing seam roof, it's going to be on rails," Kline said. The rails for the project are from California-based IronRidge Inc.
Two 500-watt and two 300-watt inverters from Solectria Renewables of Lawrence, Massachusetts, convert DC to AC current. The units were selected because of product reliability, he said. "It's a high-quality project, and we have confidence in Solectria," Kline said. "We're very interested in quality. That's what we stand for as a company-quality and attention to detail-and we want to source equipment companies that we're very comfortable with." The project took about four months to complete, with the system being commissioned in October 2013. Although crews didn't encounter any challenges out of the ordinary, Con Ed did impose several requirements that lengthened the project's completion, he said. Originally settled in the 1660s, the commercial side of Hunts Point took off in the 1960s. Although the power distribution system is adequate for existing businesses, it wasn't designed to carry excess electricity that would be generated by PV projects like Jetro's. Jetro draws power generated by the panels for its refrigeration and cold-storage operation. What it doesn't use is fed into the grid, but not before being run through one of three Con Ed transformers. Left unabated, these large flows could cause Con Ed network protectors associated with Jetro to open as if there were a fault, blacking out the customer. Con Ed programmed network protectors tied into Jetro so they don't open when panels deliver power into the grid. But the protectors will open if there is an actual fault. The new relays also allow Con Ed to monitor operations of the solar panels remotely. If needed, operators can isolate the feeders remotely. "They want to see everything that is going on with the solar installation in real time in terms of production and power flow," Kline said. "So they want to have the ability to shut down a transformer if they need to wirelessly. They get this information in real time in their control room, and their engineers can look at it. They just want to be careful with a system of this size, although Jetro is a very, very big user of electricity." The utility is the first to use this technology, known as SCADA-supervisory control and data acquisition-computer-controlled communications to manage flows of an underground network system. And Jetro is the first beneficiary of the technology, sometimes referred to as a "smart grid" connection. "We were the first to do an installation with it, and the project made it possible for other people to go ahead and do other installations in New York City," Kline said. "It's the first time that SCADA has been applied to an underground network." And Con Ed and development aren't waiting. Two side-by-side manufacturing buildings-Price Master and Quality Braid Corp.-in the New York City borough of Queens have had similar systems installed to allow PV export from isolated network installations, said Con Ed spokesman Allan Drury. The Price Master project is 400 kilowatts; the Quality Braid is 225 kW. In addition, a 900-kW PV system, which also involv-ed SCADA, was built atop a Bronx warehouse housing Manhattan Beer Distributors. OnForce Solar installed all three projects.